New ways to connect to friends - using URLs and Siri! You can now provide friends with direct-connection URLs in HeyTell! When they open the web page from their phone, they can connect to you automatically, as long as your privacy is set to Low or you've connected before! In addition, if you're using Siri, you can set up a contact to open HeyTell and select a friend to talk to! 1. On iOS, Open the Profile page, tap Change, then select the contact you've set as yourself. On Android, tap Menu > Profile. Ensure that the string you want friends to use to contact you is set inside your email or phone number fields. 2. After changing your "This is Me!" contact, set your privacy to Low. 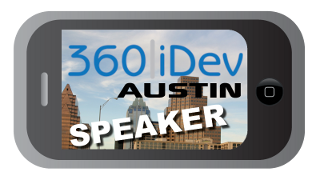 where support@heytell.com is the data you added in your email field. 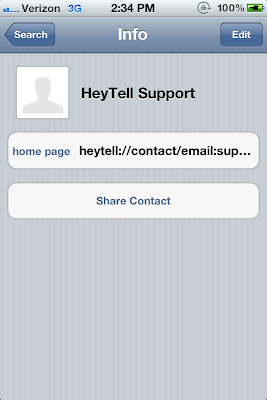 If you're using Siri, you can create a new contact, for example, we created a contact called "HeyTell Support" with a home page set to heytell://contact/email:myusername@mydomain.com. You can also annotate a current contact - just add a home page entry with heytell://contact/email:username@userdomain.com or heytell://contact/tel:13015555555 where their email address or phone number (including country code) is included in the URL. 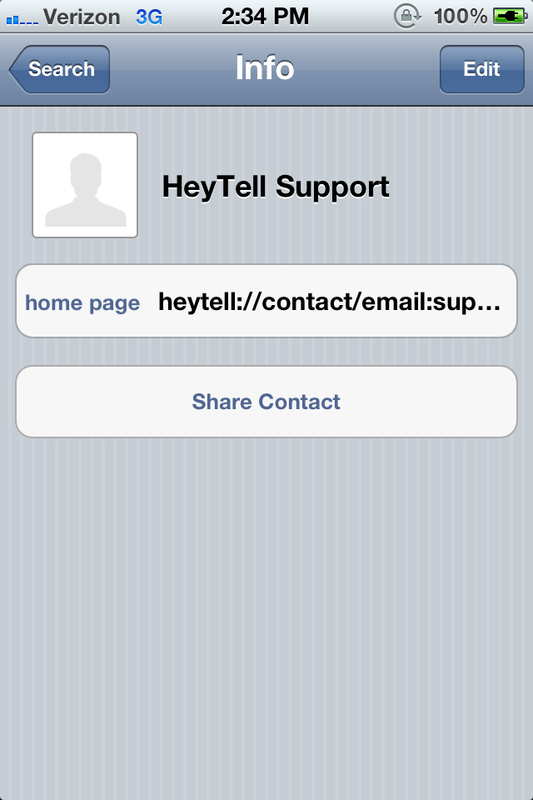 Then, we asked Siri to "Contact HeyTell Support." When she finds the contact, tap "home page" and HeyTell will open--if the user you selected matches, their name will appear in the To: field and you can HeyTell them right away! If more than one user matches the contact information, you'll be presented with a list to select from! A few caveats: When adding a new contact, sometimes it takes Siri a bit of time to recognize it, but eventually, she'll figure it out! As always, if you run into any issues or have questions, drop us a line at support@heytell.com, android@heytell.com, pop onto the Facebook page at https://facebook.com/heytell, drop us a tweet on Twitter at https://twitter.com/heytell, or join us at Google + at http://heytell.com/+!